*NEW* Now serving the east side from our Northfield location at 285 E. Twinsburg Rd. in Northfield, OH 44067. 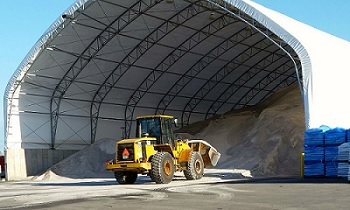 Call us at (330) 467-SALT for your east side salt supplies! We provide top quality bulk rock salt from the industry leader Cargill. We have a variety of loader buckets to accommodate different sized hoppers, ensuring we get the salt in your box and not your truck bed. If the temperature is too low and Diamond Crystal Ice Melter won’t melt the ice, we have Clear Lane to help you get the job done. We know you are busy and our loading process is efficient and most important ACCURATE. See what your paying for yourself with our digital scale readout. Most importantly, we offer 24/7 service during all severe winter weather, when you need it most. Our staff is alert and ready to get you loaded up and back to making money where you need to be. Don’t have a need for bulk salt? 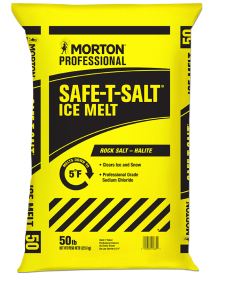 We proudly offer Morton bagged salt. One bag, one pallet, or more, come by and we will load it up. The bags are the high quality 50 lbs bags that give you the most for your money. Our tow motor is always available to load up pallets into your truck for your convenience. We want to be your local salt supplier and will go the extra mile to earn your business. We also offer a couple of different types of sidewalk materials including Experts Choice MAG blend, Experts Choice SAFETY BLEND, Morton BLUE, Peladow Calcium Chloride Pellets.